Stereotypes are formed and reinforced in countless ways we may not even be aware of—but we have to be aware of them. The term “implicit bias” refers to the unconscious attitudes, beliefs, and stereotypes that affect how we think about and behave towards others. Harvard’s famous implicit bias test for race evaluates how quickly you associate certain positive or negative terms with faces of different races, and the issue of bias has come up repeatedly in debates around police brutality. Because racism, racial prejudice, and racial bias are prominent and problematic issues in society, it’s vital that we all become aware of how they work—and how they can show up in seemingly innocuous places. This kids’ worksheet offers a perfect example of how implicit racial bias gets perpetuated. The problem? The “happy” and “proud” kids are white. The “sad” and “angry” kids are brown or black. S-Aungkh shared that she found the page in a vocabulary workbook for kindergarten and first grade kids, which had a publication date of 2009. Ascribing the “positive” feelings to white kids and the “negative” feelings to black kids is 100% not okay. When black women are often stereotyped as being angry, this kind of representation is harmful. When white people have historically oppressed black people in America, portraying the white kids as “happy” and “proud” with a 1st prize ribbon while the black kids are suffering and experiencing sadness and anger right beside them merely perpetuates unequal historical norms. Such racial representation reinforces white supremacy and sends kids of color negative messages about themselves—hence perpetuating implicit racial bias. Is it just coincidental that the races of kids were distributed this way? Possibly. Is it okay to let it fly because someone may not have done it on purpose? Nope. The CEO of the publishing company responded to people’s outcry over the page with a clear statement. 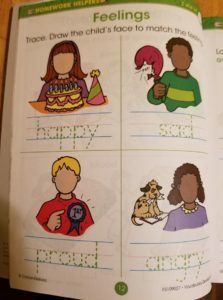 “It has been brought to our attention that our Homework Helpers Vocabulary Development Workbook features an occurrence of implied racism. We are deeply apologetic that this has happened. While this was a completely unintentional error when this book was published in 2001, I want to be perfectly clear about this: the appearance of implied racism, sexism, or bias of any nature is unacceptable to me and everyone at Carson Dellosa—and it is not what we stand for. Effective immediately, this particular title will no longer be available for sale, and our existing inventory will be destroyed. We would like to provide an equivalent, replacement workbook to any teacher or parent who currently owns this book. – The formation of an editorial committee comprised of both internal and external resources, with expertise in diversity, to create an internal process for evaluation and identification of any implied racism, sexism, or bias of any nature. Hernowitz’s response acknowledges the problem, remedies the immediate issue, explains the learning process taking place, and offers specific actions the company will take to avoid repeating the same problem—including financial support for groups doing anti-racism work. Of the various corporate responses to racial bias complaints I’ve seen, this is one of the better ones. Let’s hope they follow through and that other publishers take a page from their book. We all have to stay aware of the messages we may be getting in our everyday lives, and especially watch for what our children may be learning without realizing it. The only way we’ll slowly weed out subconscious racial bias is by recognizing examples that perpetuate it and call it out when we see it.